CHARLESTON, S.C. - The RiverDogs return to Charleston starting Thursday as they look to close out the final two weeks of their "175th season in dog years" in style. 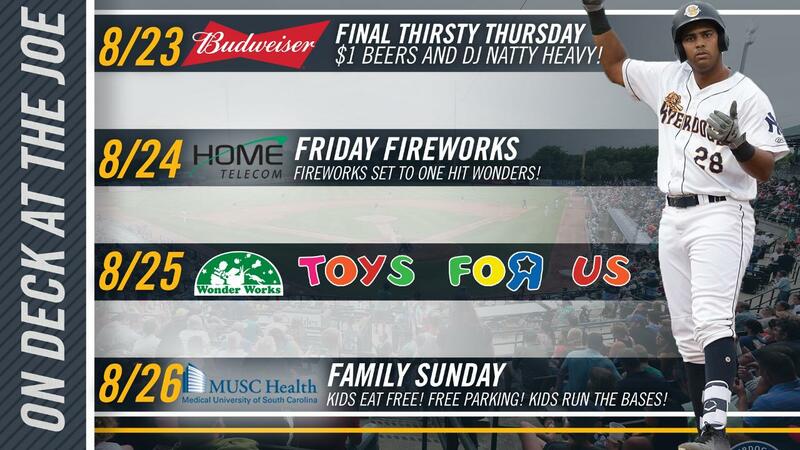 The four-game stay will bring fans their last chance to soak up the summer on the final Thirsty Thursday of the season while also celebrating the magic of toys and turning the page on the close of America's largest toy retailer. Thursday, August 23, 7:05 p.m.: Thirsty Thursday: Head to Riley Park for the last Budweiser Thirsty Thursday of the summer as the RiverDogs serve up dollar beers in the Budweiser Ashley View Pub, featuring the musical stylings of DJ Natty Heavy. Be sure to follow DJ Natty, Southern Eagle, and 95SX on social media for chances to win wristbands that give you access to Club Budweiser -- the VIP experience where you don't wait in line for beer. The famed Summerall Guards and the corps of Citadel cadets will take Riley Park by storm. Fresh off a March Madness appearance, the RiverDogs will also be honoring the College of Charleston Men's Basketball team during the game. Friday, August 24, 7:05 p.m.: Friday Fireworks to the Music of One-Hit Wonders: It's the "Final Countdown" until the end of the season and Riley Park will celebrate the flash in the pan stars of yesteryear on an evening set to the songs of one-hit wonders. Stick around following the RiverDogs' game two tilt with the Drive for a Home Telecom Friday Fireworks extravaganza set to the tunes of one-hit wonders presented by WEZL and Live 5 News. It's also a Red Shirt Friday at The Joe; fans that wear red to match the Dogs on the field can save a buck at the gate with the option to donate that dollar to the Palmetto Military Support Group. Saturday, August 25, 6:05 p.m.: "Toys foR Us" Night/Fly-In Helicopter Ball Drop: Amid the closing of America's biggest toy retailer, the RiverDogs will pay homage to the end of an era and celebrate their fans favorite childhood toys. Geoffrey the Giraffe will be at the Joe welcoming kids of all ages, as the RiverDogs take the field in specialty toy-themed jerseys that will be auctioned off during the game. With the help of Wonder Works' wonderfuntastical toy experts, the Charleston club will reserve Section 122 as a toy-only seating area for the night and are asking fans to bring new and gently-used toys for the MUSC Children's Hospital and the Salvation Army, in continuing its effort to find good homes for toys everywhere. Fans can also donate to the Toy Drive at two Charleston area Wonder Works locations: Mt. Pleasant (Belle Hall Shopping Center) and West Ashley (St. Andrews Shopping Center) leading up to the game. In addition, the night will include a "golden ticket" drawing, in which attendees will have a chance to win one of three grand prizes -- $500 shopping sprees at Wonder Works! And, Wonder Works Toy Experts will be showing off and sharing some of the magical toys available at Wonder Works. As part of the Saturdays Live at The Joe presentation presented by NASH FM and Fox 24, fans can stick around after the game for a chance to win $8,000 as part of the final fly-in helicopter ball drop of the season. Keep an eye out for Scrappy from Patriot's Point, who will be at the game interacting with fans. Sunday, August 26, 5:05 p.m.: Holy City Sunday/Charlie's Birthday: Head to Riley Park for another MUSC Health Family Sunday presented by CCPRC, Y102.5 and Lowcountry CW as the Dogs don the Holy City pinstripes to cap their penultimate homestand of the season. Every Sunday, fans park for free and kids eat free, run the bases postgame, and play pregame catch on the field. Members of the MUSC Children's Health Club (12 and under) also get in free as the home club celebrates their beloved mascot's birthday with a help from a few of Charlie T. RiverDogs' mascot friends from around the Lowcountry. The RiverDogs will also welcome in members of Charleston Southern University for a night out at The Joe. For those that can't make it out to the park, Sunday contest will be broadcast on MyTV Charleston, Channel 36 over air in the Lowcountry with Matt Dean and ABC News 4's Scott Eisberg on the call.